One of my favourite artists is Matthew Good. His music speaks to me in so many ways and I have a lot of respect for him as an artist, a musician, an activist and a human being. The album "Avalanche" is one of my favourite albums of all time. Matthew Good's tour for this album was the first show that I saw after moving to Ottawa. Safe to say, it was quite a memorable show for me. Last October, I went to see Matthew Good live, when he was touring for his new album, "Lights of Endangered Species". I believe this was my fifth or sixth time seeing a Matthew Good show. "Buy in it'll shut you up. Try it, it should shut you up..."
He is playing "While We Were Hunting Rabbits". Instantely I start crying. I cannot believe this is happening. "While We Were Hunting Rabbits" has been my favourite Matthew Good song since 2003. It's a beautiful song that just gets me every time I hear it. Never in a million years did I ever think I would get to hear this amazing song live. In addition, the piano version of this song was so raw and so beautiful. I was in heaven. Tears of happiness kept falling down my cheeks. After that, I just knew. I knew I would get some of the song lyrics tattooed on me. 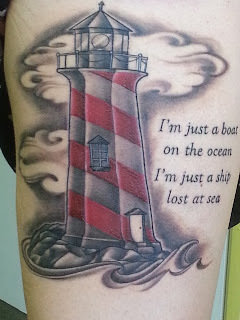 I approached my tattoo artist with the idea of the song lyrics and a lighthouse. I love lighthouses, because they remind me of home, and the Maritimes. Since my artist is quite busy, I had a few months to mentally prepare for this tattoo (and save some money). This past Saturday, I visited my tattoo artist at her shop outside of Ottawa. Exactly as I was laying down so she could get started, Matthew Good Band starts playing on the speakers. This was a sign. I was meant to do this. My tattoo, still in the healing process. After five long and painful hours, my tattoo was done. I couldn't be happier with the end result. Sometimes, it's easy to get lost and stray from our path. But if we look hard enough, there is always something or someone around that will lead us back to where we're supposed to go. That's what the lighthouse represents to me. Sometimes, I may feel like a ship lost at sea, but I always manage to find my way back. This tattoo is a tribute to the amazing people in my life who have supported me and kept me on track. This tattoo is an hommage to Matthew Good, whose words have always left me inspired. In a few days, Matthew Good will be playing an acoustic set at the Ottawa Folk Festival. I am really looking forward to the show. Stay tuned!